We have hundreds of new cow and calf-skin hides, with amazing embossing and metallic finishes. 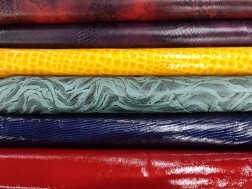 These leathers are perfect for making purses, clutches, wallets, and other accessories. While you could pay hundreds for a genuine leather purse from a big name designer, you could instead pay a fraction of that price on a leather hide to make your own unique accessory.